With the G4 bulbs there are many styles to choose from depending on how much room is aviable in the existing fitting. Also if the led is mounted horizontally or vertically. These are very common in caravans, RV, Boats and campers. 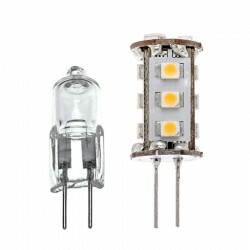 1x G4 bulb Multivoltage, this can operate from 8-30v dc.It replaces the common G4 halogen bulb f..
1x G4 bulb Back pin Multivoltage, this can operate from 8-30v dc.It replaces the common G4 ..